It is hard to believe, but Mickey Mouse is celebrating his 90th birthday this year. For an old mouse, he still looks pretty spry! One of the world’s most universally recognized and enduring personalities, Mickey Mouse sailed into our lives on November 18, 1928, in the animated black-and-white film short Steamboat Willie that premiered at the Colony Theatre in New York City. This was a turning point in the history of animation, as Walt Disney introduced the new technique of “synchronized sound”—movements on the screen corresponded with the music and sound effects. But did you know Mickey was not Walt Disney’s first cartoon character, nor was Steamboat Willie the first film made starring Mickey Mouse? In 1923, Walt and his brother Roy founded a small animation studio in Hollywood. Disney landed a deal with Universal Pictures through a distributor, creating a series of funny animal cartoons. One of his creations, Oswald the Lucky Rabbit, became an overnight sensation. The success of Oswald encouraged Disney to ask for a raise, but instead the distributor claimed Oswald as its own. Disney was out of a job. Disappointed but not deterred, Disney, along with his friend and fellow animator Ub Iwerks, co-created a new cartoon character: Mickey Mouse. There are multiple stories about how Disney and Iwerks chose the name “Mickey” for their new character. One story is that the men originally chose the name Mortimer, but that Disney’s wife convinced him to change the name to Mickey. 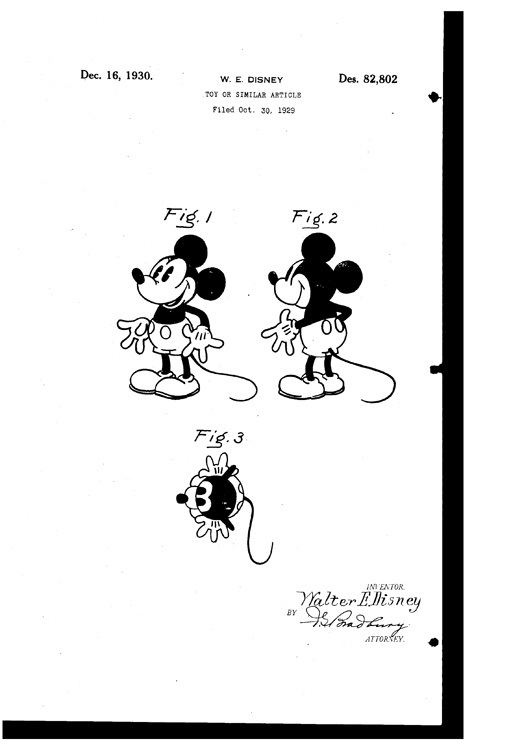 An arguably more believable story is that the men based the mouse on a wooden toy, patented in 1926 by Rene D. Grove for the Performo-Toy Co., Inc., that had the name “Micky” written in a red circle across its chest. Lesson learned from his experience with Oswald, Disney promptly registered his character with the U.S. Patent Office. In May 1928, Disney produced his first silent cartoon short, Plane Crazy, starring his new anthropomorphic character, Mickey Mouse. The cartoon was not well received by the studio, so it was put aside. Six months later, Mickey Mouse finally made his public debut in the black-and-white film short Steamboat Willie. 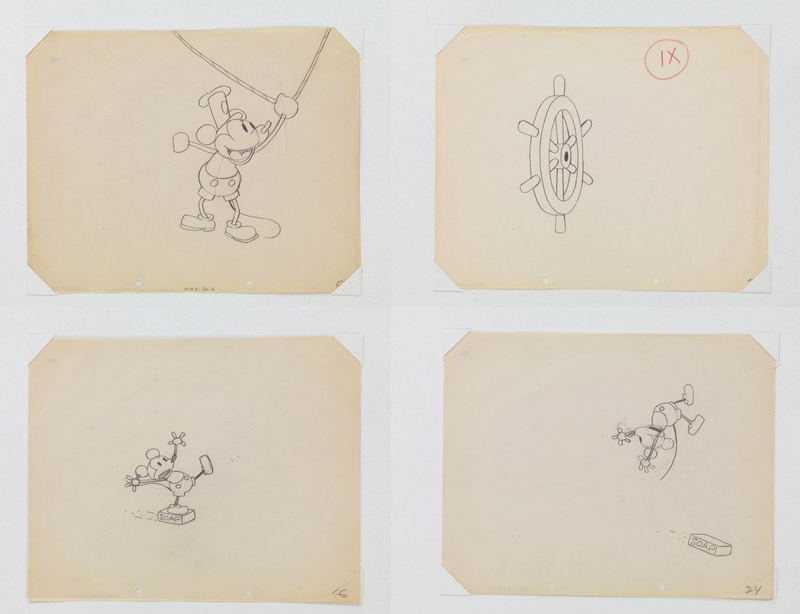 One of six original story sheets created by Disney and Ub Iwerks for their first cartoon, “Plane Crazy,” featuring Mickey Mouse. This 9x12 sketch is drawn using graphite and red and blue colored pencil. Courtesy of Steve Geppi of Geppi's Entertainment Museum, Baltimore, Maryland. The premiere of Steamboat Willie marked a breakthrough moment in animation history not just for the character, but for the introduction of sound. The film lasted a mere seven minutes and the plot was simple. Mickey is a deckhand on a steamship who causes trouble and chaos for the Captain. Minnie Mouse makes her debut when Mickey plucks her off the riverbank with a crane and drops her on the boat. Using makeshift instruments found aboard, such as garbage cans, pots and pans, barrels, and washboards, Mickey serenades his sweetheart, Minnie. The cartoon’s major innovation was synchronized sound—something we now take for granted. For the first time the soundtrack corresponded to the actions on the screen with the characters acting in cue with the voices and music. The music for the cartoon was provided by a 17-piece orchestra, including a harmonica player and three sound-effects men. While we cannot be certain, most of the animation was probably done by Iwerks, under the close supervision of Disney, who voiced all the characters. Steamboat Willie was a sensation after its premiere in New York City, and Mickey began to achieve worldwide recognition. Today, his likeness is one of the most widely used images for products and advertisements. Over the years, Mickey Mouse has gone through several transformations to his physical appearance and personality. In his early years, the impish and mischievous Mickey looked more rat-like, with a long pointy nose, black eyes, a smallish body with spindly legs and a long tail. Parents wrote in expressing dismay at Mickey’s antics in the cartoons and complained that Mickey was no role model for children. Fred Moore, a Disney animator stepped in to refine Mickey’s physical image and his character. The change was gradual but significant; Mickey’s eyes were enlarged and pupils were added to make him more expressive and life like. His ears became rounder and more pronounced, his nose was shortened, and his physique took on a short, stocky build—more youthful and childlike. More importantly, Mickey dropped his insolent attitude and became a happy, funny, polite, and kindhearted mouse—a much more acceptable role model for his biggest fans: children. The rest is history. Today, Mickey Mouse is a universal and much-loved figure that is the heart and soul of the Disney organization. Melodie Sweeney is an associate curator in the Division of Culture and the Arts. She has also blogged about the Marx Brothers, Rudolph the Red-Nosed Reindeer, and Wilkins and Wontkins.